Well it looks like this county girl is headed to the East for the first time in her life! NYC here I come! I was invited by Savings.com as part of their DealPro community to attend SaveUp 2011. I have never been to the Northeast and am so excited – and a little scared! That is one big city. I get scared in SLC! Have you taken the Savings Pledge yet??? It’s a great way to motivate you to use money responsibly. I put a new application on my Facebook Page to get you to start getting serious about saving money. FIVE randomly selected people from the first 500 people to take the pledge will win a one-on-one, personalized advice session with a 2011 DealPro! I am one of the DealPro’s but I actually don’t know who it is that is that is giving the one-on-one savings advise. If it’s me, they didn’t tell me LOL! The first time I am debt free it will be like breathing different air. No constant strain or burden on the back of my mind. I plan to be debt free (except for my mortgage) in 3 years. My plan is to pay off the debt with the highest interest rate first; then once that is paid off use the money I was paying towards it to pay down the rest of the debt. So I worked on a goal which is a little different – I got more food storage for emergencies. Now I feel more prepared for disasters or other financial problems and am ready to tackle savings! Ask CCD Readers: What are your goals? Goal Accomplished: Last year we paid off one of our cars! The other one we still owe payments on. But one car paid in full is pretty great! You aren’t going to start saving without trial and error, and without taking the time to “learn the ropes”. This is not a get-rich-quick-scheme. Being a Couponer is a way of life. An entire new way of life isn’t going to start out immediately and you can’t dive in half way. If you really want to save time couponing, you need to know all the rules before you start. I have store coupon policies for several stores – print them and take them with you shopping. I have a FREE 36-page ABC’s of Couponing guide which teaches how to do the deals. I also list the deals at 72 stores nationwide – scroll over “Find My Store” at the top of my site to see all the store coupons and deals on my site; I add new ones weekly. If you haven’t taken the time to learn how to coupon, and you want to show up at the store and save a bundle, you may be in for a big surprise. It is possible to save time and money couponing, but it won’t happen without full preparation. Learn how to coupon at one store. Each store works differently and if you try to run around doing deals at 5 stores your first week of couponing, you will most likely fail. Pick one store and learn their rules and do some shopping trips there. Also, keep in mind you can miss some deals. It isn’t saving money if you jump in the car and go in for just one deal. You’ll miss some, but you’ll save in the long run. And trust me, the deals come around again so don’t feel bad if you miss them at first. After mastering one store, start adding more to your resume. Drugstores – Walgreens, CVS or Rite Aid are my favorites. You can score nearly free health and beauty items each week; but a word of caution, these are also the hardest stores to learn how to do. I have training posts and videos for each and definitely learn one at a time. High-low Grocery Stores – the grocery stores you commonly associate with high prices are also the ones that have some of the best grocery deals! They have high every-day prices to “compensate” for their drastic sales. They expect you to make impulse buys when you go in for the great sales. This is why they have “loss leaders” or ads on their circular which are amazing, to get you in-store and then hope you buy regularly priced (expensive!) items while you are there. But not anymore, now that you’re a couponer you know better! Examples of these stores are Publix, Kroger, Safeway, & Albertson’s to name a few. Super centers – Target, Walmart etc… often have some great deals and their rules are pretty straight-forward compared to the other options, but actually the savings often won’t be as great as at high-low grocery stores. At Walgeen’s, you need to have as many items as you have manufacturer’s coupons and register rewards that you are going to be using to pay for the transaction (not ones that you expect to print). This means if you are buying 6 items and have 6 coupons and 2 register rewards that you want to use to pay for the transaction, you’ll need two filler items. Don’t waste your filler item on something you don’t need. Gellitin is found at many Walgreens for around $.20 and is more useful to you then candy. I have even bought Sunday papers as filler items at a grocery store where I needed my total to be over $50 to use a $5 off coupon. End caps are displays at the end of aisles. Before you were a couponer, you thought these were great deals. These usually aren’t and are a great way to end up over-paying for items you could have gotten cheaper later when you found a sale stacked with a coupon. This goes along with my last tip of avoiding end caps, because those are usually where you will do an impulse buy. Check your stock up price list and then see if the “deal” paired with any coupons you have is a stock up price. If not, pass on the sale. More deals will come along later. Don’t be the lady at the checkout sorting through coupons and holding up the line. Every time I am at a store and find an item on my shopping list, I pull the coupon(s) I am using and put them in a tab at the front of my binder. Then when I get to the register, all my coupons are in one place and ready to go. Let’s make couponing fun, one coupon at a time! If you have more tips to share, please post a comment. Walgreens Brand Health & Wellness Savings & a $50 Gift Card Giveaway! Now I know we can stack sales with coupons and score great deals on name-brand products, but those sales aren’t every week. Instead of paying full price for medicine, when I am low I can trust Walgreen’s Brand Health & Wellness products to get the job done – and they are pharmacist recommended. 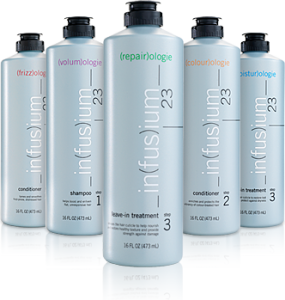 Not to mention they have mostly the same active ingredients as other brands, and have a 100% satisfaction guarantee. There are several giveaways going on for Walgreen’s gift cards (20 total), plus one Cuckoo for Coupon Deals reader can enter below to win as well! 1. Leave a comment on this blog post: what in your favorite Walgreens Brand Health & Wellness Products? Ends June 28th at 10pm MST and winner will be announced on my site & through my giveaways email newsletter. Giveaway provided by Cuckoo for Coupon Deals. Well my stock up price on 12 packs is $2.40, so this is a great deal! Although this is only one per customer, so make sure to send in your spouse too! 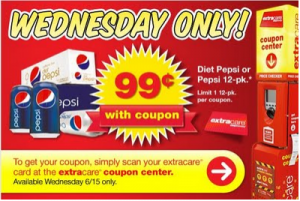 According to CVS, the magic coupon machine will be issuing $.99 Pepsi or Diet Pepsi 12-packs on 6/15 only! Not valid in NY and CT.
Here’s more CVS deals you can score when you go in. 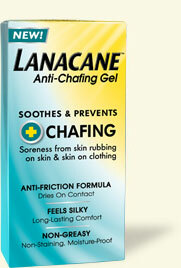 FREE sample of Lanacane Anti-Chafing Gel! Just click on the “Try it Free” link in the lower right hand corner. Giveaway: BoaPix 16×20 Custom Photo Canvas! Photos/collages go to an artist first for color correction. Then the canvas printer they use is very high end. All their work is guarenteed. They did not have a single return this year! These are very expensive canvases that we are just getting a great deal on. I know there are other canvas deals out there, but none are artist-designed professional quality that will last a lifetime like this. Giveaway: 1 Winner Gets a 16″ x 20″ Canvas! 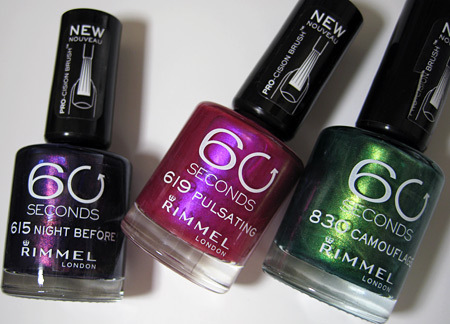 Walgreens Deal: $.19 Rimmel Nailpolish & FREE Asprin! Walgreens has Rimmel Nail Polish on sale for $2.19 this week. Final Price: Free for both! Final Price=$1.99 ea. after coupon and RRs! More Walgreens deals this week! 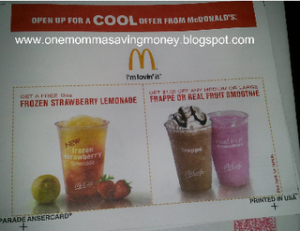 FREE Frozen Strawberry Lemonade Coupon + LOWER Newspaper Rates! Do you get multiple copies of the Sunday paper? I get 4 copies for about $18 per month total. So each month I subtract my coupon savings, minus my $18 newspaper subscription, around $10 for printer ink and paper, and $15 in extra gas driving to extra stores. I still end up saving an additional about $300-$500 per month using coupons, more than worth it for the cost of the paper! I recently re-negotiated prices with all four (including The Daily Herold) newspapers in Utah, so if you want a discounted rate learn more here! Coupon Classes: I am hosting an online FREE coupon class soon, stay tuned for more details! I am thinking it will be this Saturday but I am not 100% sure as I don’t have the streaming setup yet. Anyways, there should be a postcard in your Parade magazine from yesterday’s paper that contains a coupon for a FREE Frozen Strawberry Lemonade from McDonald’s! I got four of them since I get four copies of the paper, plus I get four of all the coupon inserts. All winners must email me at deidre@CuckooForCouponDeals.com within 48 hours or forfeit their prize and a new winner will be selected. My emails were all getting sent to peoples spam folders, so from now on you need to check the site or the giveaways feed or giveaways emails list to see if you’re a winner! 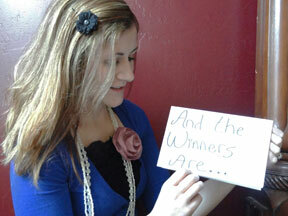 5 Winners Get Mod Bod Cami’s Sets! Everyone should get your email with your membership info the next 10 hours, if you haven’t gotten it already. If you don’t get it in 10 hours, email me and I’ll re-submit your info! 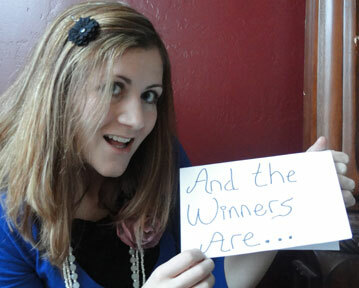 not yet posted- come back later this week for this BIG giveaway! Make sure to check Cuckoo for Coupon Deals every Wednesday for new giveaways to enter! 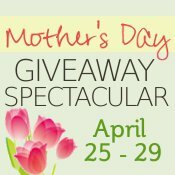 Check out my giveaway linky page for a list of all other current giveaways on other blogs. $0.55/1 ANY Size SunnyD Coupon! $0.55/1 ANY size SunnyD product coupon! Beware of the ad that prints after the coupon prints! This should make the small sizes free, especially on doubles – today is Walmart Double Coupon Tuesday in Utah County, and other stores nationwide double as well! Speaking of which, I am creating a list of which stores double, let me know of ones in your area that double!